This is a country wide Chocolate Shop Directory with a bit of chocolate information on the side. 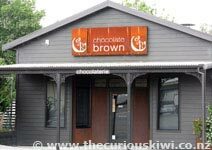 We're chocolate novices so the information is intended as a guide for those who want to make chocolate stops as they travel NZ. 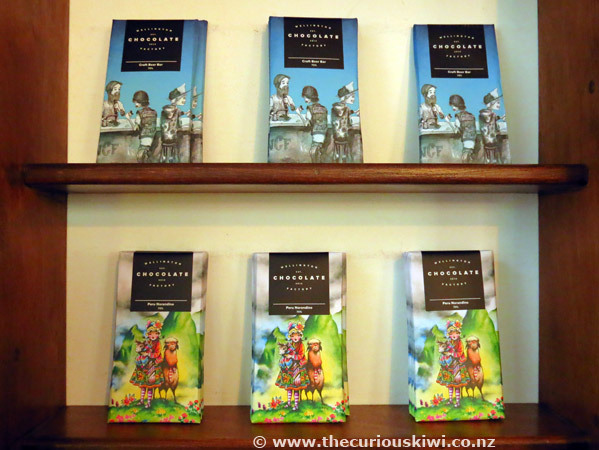 If you'd like tips on how to train your taste buds and do a chocolate tasting, the book For the love of chocolate - A Kiwi indulgence by Stephanie Everitt (co-owner of Devonport Chocolates) will get you started. For more information about the history of chocolate the author recommends The True History of Chocolate by anthropologists Sophie & Michael Coe. Watch chocolates being made, and choose from the range that includes naturally nutty, fruit favourites and sugar free. The staff are very welcoming and generous with samples. Every now and then I taste something that I think is beyond delicious and that's what I think about Makana's macadamia butter toffee crunch. Purchase in store or online. Open daily. Next to Makana Confections you will find the modern and air conditioned Makana Chocolate Cafe. The cabinets are full of delicious looking treats like boozy chocolate cherry cake, lemon meringue slice, chocolate fondant, and orange ganache tart (photo above). 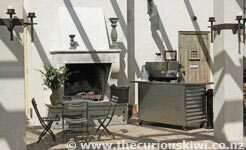 There's also a gelato bar and seating outside for sunny days. Open 7 days, 8.30am - 5pm. 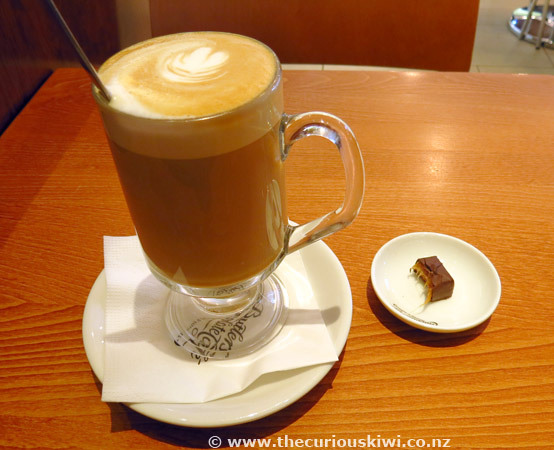 The Chocolate & Coffee Show is held in Auckland. 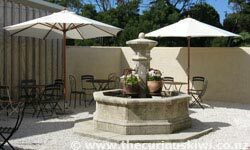 Bennetts of Mangawhai is built in European style and it's much more than a delightful chocolaterie, there's also a cafe and a lovely courtyard for dining. Definitely visit Bennetts of Mangawhai if you're in the area. Open 7 days. You can shop online, visit the chocolaterie and cafe or buy products from the many stockists listed on the website. 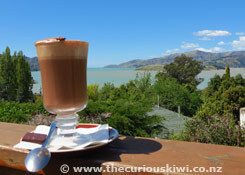 If you'd like to say Kia Ora or Ka Pai in chocolate see the CB@NZ range. There is an area at the back of the cafe with bean bags where children can settle in and watch a DVD. Also worthy of note are the well designed bathrooms. Hours. Purchase Fairtrade organic chocolate from Trade Aid shops nationwide. Bohemein have a store in Wellington and Auckland, and an online shop. They have some of the best novelty chocolate designs I have seen, and if you're lucky you may get to sample some of their Belgian chocolate in store. As well as delicious chocolate they have gelato, coffee and hot chocolate to go. Open 7 days. 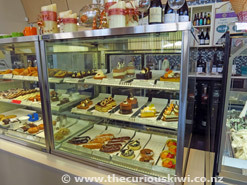 Visit the Beach Haven Factory Shop & Cafe or the Takapuna Dessert Cafe & Cakery. Chocolate Earth is a cake and dessert store that also sells chocolate and fudge. Open 7 days. "National Chocolate Covered Raisin Day is March 24, and International Chocolate Day is July 7. Shop for chocolates and enjoy desserts, beverages and cakes in the dessert cafe. It's a cute store and popular, it can be difficult to get a table outside on a fine evening. A range of chocolate gift box selections can be ordered online. Open 7 days, 11am - 10pm. 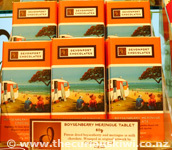 Devonport Chocolates sell Kiwiana tablet chocolate, the designs were created by local artist Fraser Williams. 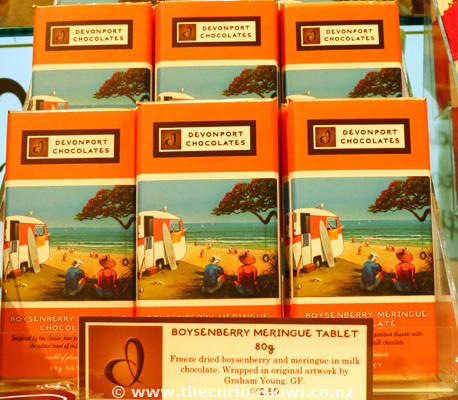 I purchased a block of the boysenberry meringue chocolate for a caravan fan. You can also buy chocolate shoes, a chocolate puzzle, and Single Origin Samoan Chocolate. Shop online or visit the stores. Open 7 days. Stephanie Everitt, co-owner of Devonport Chocolates is the author of For the love of chocolate - A Kiwi indulgence. As well as a range of French pastries and cakes, Philippe's sell chocolate spreads, and gift packs of chocolates and truffles in flavours like lychee and rose, basil, and fig. See the website for opening hours, you may also find Philippe's products at food markets around Auckland. Theobroma sells individual Belgian style chocolates and has a menu of chocolate drinks and desserts including a fruit and chocolate fondue. Theobroma is a franchise so chocolate lounges will pop up at many locations. Chocolate Lounge locations in Auckland include - Westfield St Lukes, 80 St Lukes Road; Sylvia Park, 286 Mt Wellington Highway, Mt Wellington and Botany Town Centre, 588 Chapel Road, East Tamaki. Open 7 days. 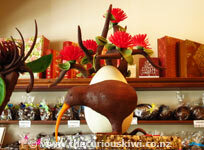 Chocolate classes in Auckland - learn to make chocolate truffles at Criollo Chocolates. You can build a box of chocolates at Colestown or buy one ready made. 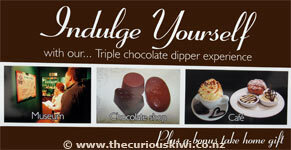 Unusual flavours include a pink champagne truffle, limoncello, and chilli and manuka honey. Open 7 days. 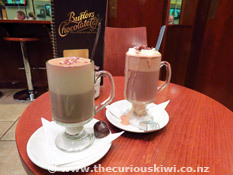 Butlers Chocolate Cafe in Sylvia Park has plenty of seating and serves sweet and savoury treats as well as chocolate many ways. The coffee prices are higher than you will pay elsewhere BUT you get to choose a chocolate so that sweetens the deal. Open late 7 days. Send a chocolate bouquet - Edible Blooms. 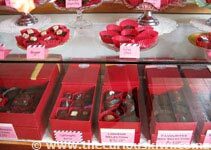 As well as selling gift ware, Cabbages and Kings have a chocolate cabinet and sell packaged and individual chocolates from Devonport Chocolates, Bennetts of Mangawhai, and deSpa in Christchurch. You can buy strawberry pavlova, and feijoa milk chocolate blocks from Donovan's, and hot chocolate and chocolate cake are on the menu in the cafe. Open Monday - Friday 7am - 3pm, closed weekends and public holidays. Chocolate santas, dark chocolate kiwifruit, and cherries are some of the products made by Waikato Valley Chocolates. The factory shop is open Monday - Friday, 8.30am - 4.30pm. The chocolate is also sold at The Warehouse - go NZ made. 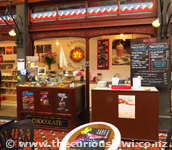 There are Theobroma Chocolate Lounges in Westfield Chartwell, corner Hukanui and Comries Roads in Chartwell, as well as Centre Place on Bryce Street in Hamilton. 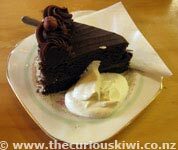 If you are looking for a chocolate hit in Rotorua, Fat Dog Cafe at 1161 Arawa Street has 'Death by Chocolate' on their dessert menu. On our visit 'Death by Chocolate' was made up of a hot chocolate pudding, a chocolate cigar, chocolate mocha pot, chocolate ice cream, and a black cherry gateaux. The chocolate pudding was our pick of the plate, the chocolate cigar was a miss for us, but overall it was a good dessert and at $18.40 it's excellent value as it's big enough for at least two people to share. (Note: The components of the dessert may change from time to time. In the photo, chocolate ice cream is in the same pot as the chocolate mocha). 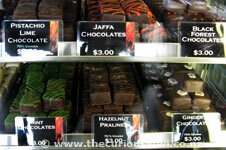 Giles Chocolatier is at 169 St Aubyn Street in New Plymouth, or you can buy online. They've got chocolate covered at Silky Oak - watch the chocolate making process at the onsite factory shop, have a cup of hot chocolate in the cafe or join a chocolate tour. We enjoyed learning about chocolate through the ages at the onsite museum. La Petit Chocolat in Hawkes Bay make organic, fair trade chocolate, you can also try some of their hot chocolate at the Hawke's Bay Farmers' Market. Alexandre Patisserie is tucked away at 9 Coleman Mall, just off The Square. As well as chocolate treats you will find traditional French fare like almond croissants, baguettes and tarte paysane (farmers tart). The Plaza is home to a Theobroma Chocolate Lounge, and Munchkins which sells handmade chocolate and fudge (type "chocolate" into the store finder search box to find out more). 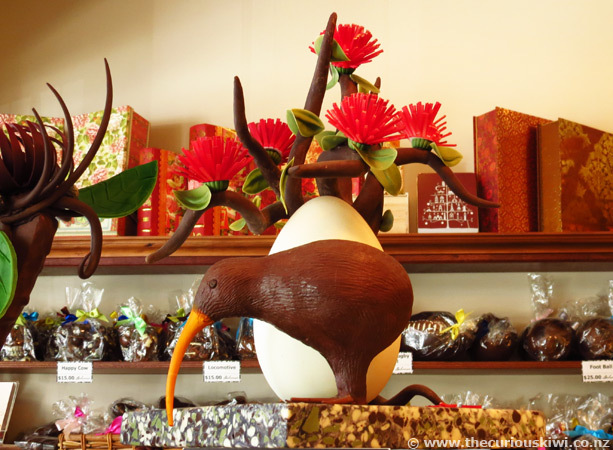 Two Chocolate Festivals in Wairarapa - Chocol'Art Festival and Carterton Chocolate Festival. 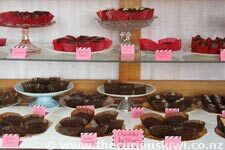 We liked the chocolate bowls filled with goodies at Schoc, Martinborough wine fans will enjoy the truffles flavoured with wine from local vineyards. If you're a Schoc-oholic there are a list of stockists on the website. Open 7 days. (An interesting article about Schoc's 'chocologist'). 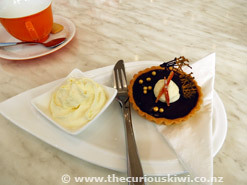 Update: Schoc have opened Capital Schoc at 31 Waring Taylor Street in Wellington. 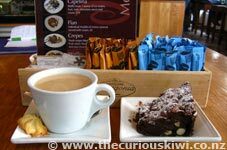 A neat Pinterest page of hot chocolates by a world traveller in search of the Ultimate Hot Chocolate. 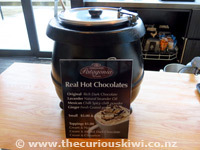 Bohemein Fresh Chocolates in Featherston Street serve hot chocolate, coffee and chocolates to go. They have a neat range of novelty chocolates, and if you're looking for Christmas stocking fillers there's a Christmas Collection. You can also learn to make truffles at a Chocolate class. Opening hours. de Spa is a small shop tucked away in the Old Bank Arcade, it is a retail store for the de Spa range that are produced at the factory in Christchurch. 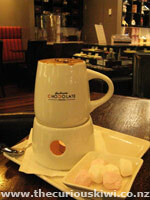 Butlers offer a sweet deal - most beverages are served with a complimentary chocolate on the side. I revisited Butlers in July 2015 for a peppermint flavoured hot chocolate that came with a chocolate of my choice (hazelnut dark chocolate). The peppermint hot chocolate was teeth chattering sweet but it was a nice way to warm up on a winters day. Glasses of hot chocolate start at $5.20, $3 for children. Chocolate desserts and ice cream sundaes are also on the menu. Butlers on Willis Street is open 7 days. 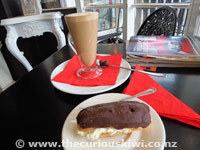 Another chocolate shop in the Wellington area is The Chocolate Story in Petone. 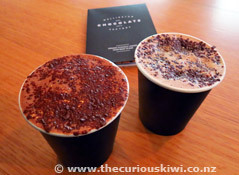 Five dollars will get you a cup of single origin hot chocolate at Wellington Chocolate Factory. Made with ground chocolate and milk there were four types of hot chocolate to choose from on our visit, we chose Peru, and salted caramel. We took a seat at the large communal table in the industrial space and sipped and nodded, and decided that the salted caramel was our favourite. We also admired the art work on the chocolate bars, they're not the cheapest bars in town at $11.50+ for a large block (above) but you may find the bean to bar craft chocolate worth it. Visit Facebook to keep up-to-date with chocolaty developments. 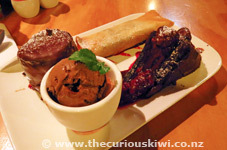 The NZ Chocolate Festival is held in Wellington. As well as their chocolates, Makana have a range of chocolate books, chocolate themed birthday cards and chocolate candles. As is usual at Makana the friendly staff enthusiastically hand out free samples. Open 7 days. 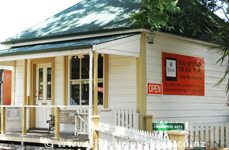 At the Nelson Market on Saturday morning in Montgomery Square look out for Hogarth Craft Chocolate and Aroha Chocolate. Rosy Glow sells couverture chocolate from a pink villa in Collingwood. It's a delightful little chocolate shop with equally lovely staff. The chocolate is up there with the best we've had - we chose a chocolate caramel log, and peppermint and ginger individual chocolates. Other flavours include rum and raisin, cherry cobbler, almond, coffee, and cashew crunchy. You can make your own box selection or buy one of the ready made gift boxes. Open 10am - 5pm Saturday to Thursday, phone 03 524 8348. "Would you like to make your own chocolates? Visit www.homestylechocolates.co.nz - they supply chocolate moulds and chocolate making equipment. deSpa make more than 70 varieties of hand made Belgian chocolates and sell sugar free options as well as cooking chocolate. deSpa chocolates are sold at a variety of retail stores around NZ. Theobroma Chocolate Lounge is on Level 2, store 266 in Westfield Riccarton, 129 Riccarton Road. 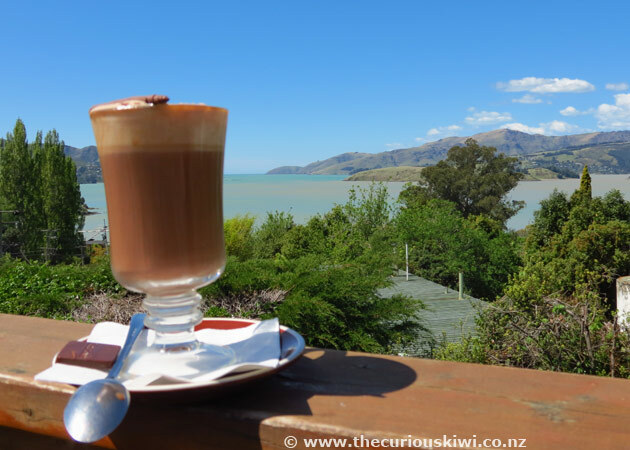 She Universe in Governors Bay has beautiful views over the tree tops and out to Lyttelton Harbour, a seat on the balcony is perfect for a sunny day. She have a breakfast and lunch menu, chocolate desserts, hot chocolates and a selection of smaller chocolate treats at the Chocolate Counter. We visited for hot chocolates, the infamous She brownie, and our favourite, cacao balls - see She Universe, Governors Bay via thecuriouskiwi/blog. 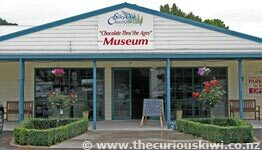 Chocolate classes are held at the Chocolate School, and there is a Chocolate Bar at The Tannery in Woolston, it's an option for those who don't want to drive the 20 minutes or so to Governors Bay from the city. Take your nana or mum on a trip down memory lane with Queen Anne Chocolates, made in Christchurch and distributed around the country. 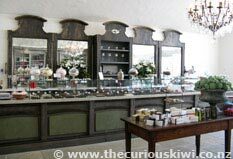 Coco is a lovely shop/cafe with sweet treats in the cabinet and a gorgeous selection of truffles and small chocolates. Coco also stock the Chocolate Brown range. There are bags of organic hot chocolate and empty chocolate cups waiting to be turned into delicious desserts. Whittaker's is a family owned and operated company that has been making chocolate in NZ since 1896. To find out more visit the chocolate website. 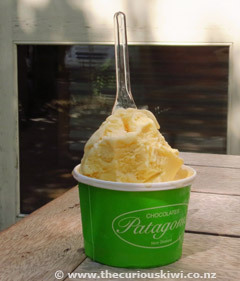 Patagonia Chocolates is in a superb location on the lake front in Queenstown, it's a very popular meeting place. There is seating inside and out and free WiFi. There are some unusual chocolate combinations like roasted sesame seeds blended with dark chocolate, and rice bubbles blended with white chocolate. They serve a chocolate croissant breakfast, and chocolate fondue for dessert. 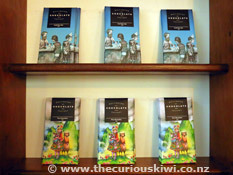 Update: Patagonia Chocolates are also at 2 Rees Street, and Queenstown Airport. Patagonia Chocolate's new location on Ramshaw Lane is much bigger and has seating inside and out. There is a freezer full of ice cream and frozen yoghurt, lots of fudge, and ofcourse chocolate. 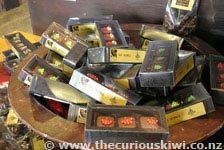 You can buy whiskey liquer chocolates at Hokonui Moonshine Museum in Gore. Chocolates infused with wine, and Speights beer are produced by The Seriously Good Chocolate Company and can be found at many retail outlets. 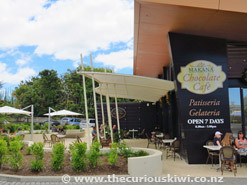 There is a small cafe onsite, and their instore Kiwiana range includes chocolate fish 'n' chips, and individual pavlova flavoured chocolates. 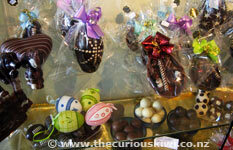 Factory tours and chocolate making classes are an option for groups. Enjoy a cup of hot chocolate in your own kitchen with Annabel Langbein's Mexican Hot Chocolate recipe. Good one. If you wanted to send me a couple of photos I can add just drop me an email. 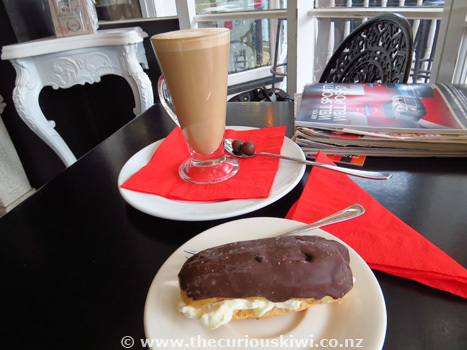 The Chocolate Story has reopened in Petone. At the same address. Now with more vegan options than ever! Thanks Melanie. I had a look at the Mary Gray website and saw the cinnamon bars, it sounds like I've been missing out by never hearing about them. I'm going to see if Countdown sell them. I think Mary Gray are still making both types of cinnamon bars. They can be found in supermarkets, on their website or give the factory a call. The hard ones are my FAVOURITE and I've been stuffing my face with them since I was a kid! Admin: Can't say I've ever heard of cinnamon bars, but I saw there are quite a few recipes for them online. As for the big fish, try Nyco, if they don't do dark you could always melt Whittakers dark if you can find the size of mould you want. Homestyle Chocolates have moulds, or Stevens may have them?
? Please advise where to find LARGE dark chocolate fish ? ?